When dismissal rolls around these days at the Thomas Carroll Elementary School in Peabody, Massachusetts, parents are not happy. “It’s ridiculous,” said Kathleen Capela, a school mom. The massive snowbanks have turned the two-way street in front of the school into a tight squeeze, making it almost impossible for two cars heading in opposite directions to get through. 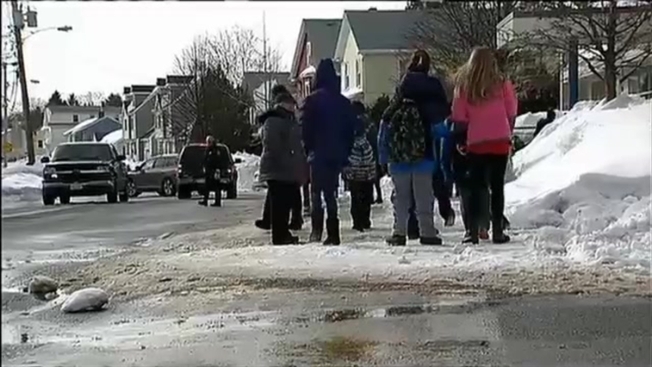 Police were on scene Tuesday telling parents to move their cars from one side of the street because there’s just not enough room. The narrow road is similar to what many neighborhoods are dealing with because of all the snow, but the added concern here is that there are many small children trying to navigate. Parents are worried with the gridlock, someone could get hit. There are sidewalk issues too. While some have been plowed, there are spots covered with huge snow piles and the sidewalk just comes to an end. Several parents say they've been calling everyone from city hall to the school district. “And after making so many phone calls to city officials, I got fed up and I contacted you people,” said Jennifer. Necn called Peabody’s Mayor, Department of Public Works, the Peabody School Superintendent and the principal of the elementary school, but nobody responded.